In the lifespan of the Nintendo Gamecube, a lot of hidden gems found themselves buried beneath the short time of the system’s production- at least compared to other systems of the time- and limited exposure. Give it a quick thought, especially if you had a Gamecube at the time. How many role playing games can you think of off the top of your head for the system? If you named more than two, you probably played them or struggled to get access to them in some way. The truth of it is that while the Gamecube had some great role playing games, not many people knew about them or remember them now. 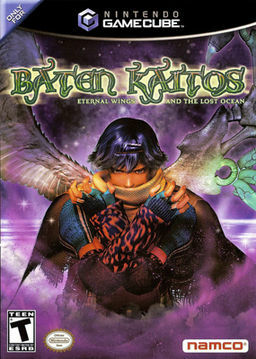 Baten Kaitos: Eternal Wings and the Lost Ocean is one of those hidden gems. There are a couple of flaws to be had, but what exists is a solid game worth putting the thirty five or so hours into. goes on a quest to avenge his grandfather and brother’s death. After meeting a young woman named Xelha, he sets out on a quest against the Alfard Empire who is trying to resurrect the evil god Malpercio. Throughout the adventure, they meet other adventurers who help them and join their cause. The game plays out as most role-playing games do (in more ways than one), but the world is a bit more interesting, taking place on five floating continents that make up the world in the sky. Each continent has a few locales to visit where the majority of the game’s exploration takes place. Other locales open up, but the main avenues of exploration are varied and beautiful. Combat and the battle system are where the game shines. Throughout the game, you find ‘Magnus’, which can be weapons, armor, recovery items, or various other objects, their essences trapped in cards that you sort into a deck for battle. It gets incredibly confusing to explain how this works, but each weapon/armor/item Magus has an attribute- fire, water, dark, light, wind, and time- and number(s) on it. When you assemble your deck outside of battle, you must keep in mind opposing elements, numbers, and statistics of the item on the card. Once you’re in battle, you receive a ‘hand’ of Magnus cards from your deck which you can use to attack, defend, heal, or do carious other things with. You can use the numbers on these cards to make pairs or straights, much like in poker, to gain a bonus in your attack or defense. It seems more complicated in words than it is in practice. In reality, though, while it can be somewhat random and deterring, it tends to keep the fights engaging and fun where in other games, random enc ounters can become a tedious hassle. Another interesting concept is that you play as a ‘Guardian Spirit’. Kalas, at the beginning of the game, asks your name, and he’ll break the fourth wall to speak with you or ask questions throughout the game about your opinion on things. At one point, he asks if you trust one of the characters in your party regarding a stolen item, and for a second, I was worried it may actually affect my game and that character. In essence, the game is treating you like a player of a game, watching and controlling these people, rather than keeping everything closed off, like all other games do. While the things that you say and do don’t necessarily change the story, it’s a neat touch to be acknowledged by the characters. Everything else in the game is pretty standard issue. The plot doesn’t make many strides until later in the game. Admittedly, it has one of the best plot twists I’ve seen in a while, but with the game being two discs long, you don’t get to much outside of the usual fare. The characters don’t tend to explore much outside of what has been seen before. You still have the same set of elementally themed dungeons. While it isn’t groundbreaking, the game does have some fun nostalgia factor, as it feels like an old school role playing game. The game also has a ton of side quests and stories to embark on. Some of them are simple fetch quests, while others take the entire game to go through. None of them are mandatory, though they tend to offer up some useful Magnus for battle or equippable items. Each character even ends up with their own side quest which, while interesting, tends to try and shoehorn in a bunch of backstory for them that could have been added in throughout the game itself. While you do learn about the characters on a base level, dealing with their demons is pretty open and shut for what the game offers up in length. Visually, the game is beautiful. While the character portraits that accompany speech bubbles can be a little off from expression to expression, everything else is absolutely gorgeous 100% of the time. Backgrounds, dungeons, character models- everything looks fantastic. The art of the Magnus cards is also pretty stellar, though obviously simpler than the rest of the game. It is very hard to explain how artistically sound this game is, and the aesthetic is interesting overall, keeping a colorful and imaginative presentation the entire time. The music in this game is top notch, as well. The battle theme in particular, which you’ll hear throughout the entire game, was a song that I was tapping along with even after thirty hours of hearing it off and on. The final dungeon’s theme also had me reinvigorated to get through the game. Where the aural aspect fails is the voice acting. I respect that there are people behind this art, as there are all other arts, so I won’t go too far into my feelings on the voice acting. I would recommend that players play without the voice acting on. Acting aside, the voices sound like they were recorded in a tunnel and have a strange echo to them. This game has an engaging world and a fairly ho-hum plot, but it is a solid game with some neat tweaks to it. Finding the game could be tricky, as the game has not been re-released in any way. If you’re an RPG fan, though, and you can deal with a slow start to your games, I would highly recommend Baten Kaitos, which had me glued to my system for some time. …can I go into my feelings on the voice acting? Because I hesitate to even call it “acting”. It’s flatter than my chest was six months ago. It’s uniquely bad.